Just in case anybody was still on the fence regarding Swindon’s chances of making the play-offs, Richie Wellens’ side emphatically told them on Saturday we will be kicking off another League Two campaign this coming August. The weather conditions did play a part in one of the worst games at the County Ground this season, but it can’t be blamed entirely with Town never fully getting out of second gear throughout the 90 minutes. It was a performance of a side that knows these next nine games will be devoid of any meaningful competition. The only highlight of the afternoon was the 50th anniversary celebrations of Swindon winning the League Cup in 1969. It was great to see the majority of that famous Town side parade on the pitch at half time with their trophy. The only downside was the timing of our most famous side being presented onto the pitch; with thousands of fans leaving their seat, only half the crowd in attendance saw our Wembley heroes paraded on the pitch. It would’ve made more sense to do this at 2:45pm, so the majority of Town fans would be in their seats, and it would also give the fans something to cheer before our current side walks out the tunnel. Maybe there were some logistical reasons why this didn’t happen, but it was a shame to see our heroes waving at near empty stands last Saturday. 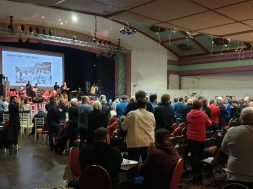 Thankfully there were no problems the previous evening as the Trust STFC 50th anniversary party and AGM went down a storm with all those in attendance. As more details emerged about the upcoming community share project set-up to raise the money needed to purchase the ground. It’s clear when the scheme is up and running it will bring a real excitement around the football club. 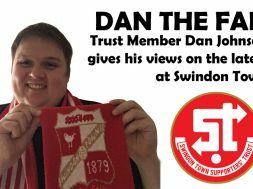 The idea of fans owning shares in our home is a brilliant one, and a huge amount of praise needs to go to everyone involved at Trust STFC for all their hard work over many years in making this happen. Despite our lack of success this season on the pitch this current campaign will be remembered for our first strides forward in all Town fans being proud to call the County Ground the home of Swindon Town Football Club. More details on community shares will be released in the coming weeks. This Saturday Town welcome 19th place Morecambe to the County Ground as Wellens’ side battle to get back to winning ways over an improved Shrimps side who have won two of their last three games to take themselves nine points clear of the relegation zone. It will be interesting to see who puts in a shift this Saturday to show their manager they want to be around next season, and who has already downed tools and hasn’t got the attitude needed to get Town promoted from the basement division in 2020.